﻿ E-Waste Recycling Orange County Computer, Inc.
Orange County Computer® is an authorized collection facility for e-waste recycling. Click here for the Lake Forest Tech Repair Center Location. Please call 949-699-6619 or contact via Email prior to arriving to verify that your e-waste items can be accommodated. Electronic waste or e-waste is discarded, surplus, obsolete, or broken electrical/electronic devices. Some electronic waste, such as CRTs (old Monitors) and circuit boards, contain dangerous contaminants such as lead, cadmium, beryllium, mercury, and flame retardants. As a result, exposure to these contaminants it can be extremely hazardous to your health. Equipment retires at an alarming rate as technology evolves. Over three quarters of all computer equipment purchased in the US is in office closets, basements, garages, and storage units throughout the country. 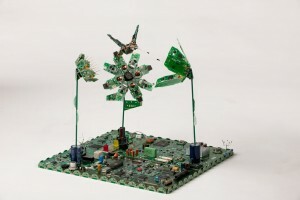 In addition, 70% of toxic waste found in landfills consists is e-waste. Discarding old electronic equipment in landfills or by incineration wastes valuable resources. It also releases potentially hazardous materials into the environment via leaching and toxic air emissions. In addition to environmental and health concerns, improper disposal of your old equipment could be subject you to EPA violations. This could result in legal litigation, fines, and costly clean-up responsibilities, not to mention the tarnishing of your company’s image. By reducing the amount of trash produced and reusing materials, we can all help to not only protect the environment and conserve natural resources, but we can also sustain the environment for future generations. Recycling raw materials from end-of-life electronics is the most effective solution to the growing e-waste problem and the best thing to do for our planet.